With her fondness of the sea she found she could no longer stay in her old hometown. That’s how she wound up at the beach. And that’s also how she became a Professional Author’s Assistant. She had closed her computer training center and was in business as a Technical Virtual Assistant and freelance Technical Writer. When she returned from sailing the world, she realized she wanted to go a different direction and focused on technical and ghost writing, publishing, training, and coaching. 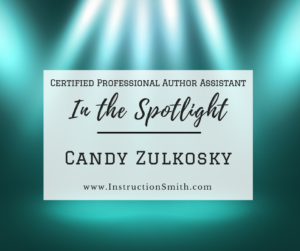 She didn’t have a name for her unique blend of skills, until she remembered meeting a Professional Author Virtual Assistant and reached out to find out how she became certified. The rest, as they say, is history. Candy has been self-employed as a freelance writer, trainer, coach and marketing consultant for most of her career. She’s been self-employed since her 30th birthday and before that was in the corporate world and writing on the side as well as taking on full-time contracts like the three years she worked as a technical writer documenting the process of building a nuclear reactor. 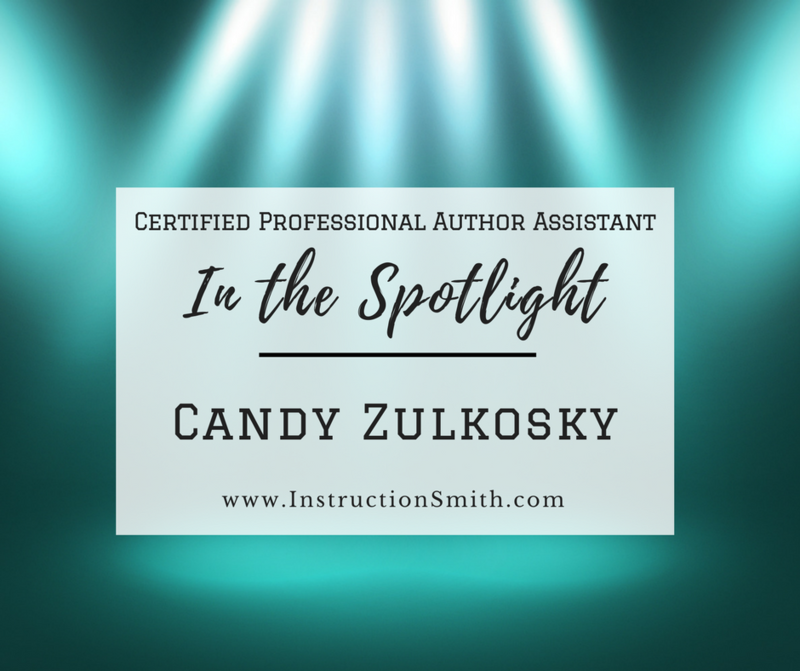 She has taken both the Author and Speaker Assistant courses and earned the title of Certified Professional Author Assistant in 2015. She tells us that the courses allowed her to target and fine-tune her business. Since she started the courses having a lot of knowledge gained from previous experiences across a broad range of jobs and projects, she was able to fill in the gaps and use the training to fine-tune her business plan. This has allowed her to choose a direction that she truly loves and that fits her unique skill set and experience. Like a lot of us, she has a wide range of interests and craves knowledge. She’s currently finishing up a certification with the 100 K Impact Coaching program. 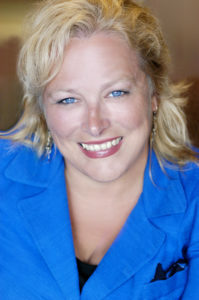 She considers herself fortunate to be an author of multiple books and to have taken two of them to best-seller status. It brings her joy to transition writers into authors and she takes pride in every book her ‘author children’ successfully bring to press. Candy takes pride in being authentic. She is comfortable with who she is and surrounds herself with only those people who she truly wants in her life. She brought her father to live with her and cared for him after illness made it impossible for him to live alone. She continues to look out for his best interests and safety having found a facility to ensure he continues to be well cared for. She also describes herself as eclectic. She’s not a ‘traditional’ author’s assistant. Author’s Assistants are all business owners and each of us identify the niche that fits what we do best. She feels she works best with writers to help them develop their voice, gain clarity in their message and goals, and gain invaluable experience in the entire process of bringing a book to publication. She teaches her author clients to do as much (or as little) of the process as they want to learn. In her experience, recognizing and acknowledging the individuality of each author allows her to offer services that empower them to focus on their own strengths and to know what support services to engage. Hence the title, Writer SUCCESS Coach. That’s her end goal: that each author she works with will have all of the success they envision—and more. When asked if she has any advice for someone considering becoming a PAA and/or PSA Candy replied, “Be sure you have a passion for working in your own business. It helps if you have great skills in an area that authors will find invaluable. Editing, organizing, book design and layout, researching, event management, project management, fluency in a second language—these are only a few of the skills that can be turned into targeted businesses for an author’s assistant. Also, be sure that you have really great computer skills and are not afraid to work remotely. You will almost certainly be working with clients from around the country at the least, and entirely possibly around the globe”.